TFP encapsulates the domain knowledge and best practices of providing trade solutions worldwide. It is built on an open and flexible architecture incorporating best practices and international standards. Providing options for full or partial implementation, TFP also enables governments and the global trade community to scale according to their readiness. When all TFP functions are fully deployed, maximum synergies for coordinated processes between Customs, Other Government Agencies (OGA) and the trade community can be achieved. We provide a comprehensive product suite that can be offered as SaaS or on-premise. Seamless integration among all functional areas and stakeholders gives customers a holistic approach to trade facilitation. With 20 years of extensive track record of working alongside Government and harnessing relevant knowledge capital, we have devised a 5-step approach proven to enable all stakeholders to collaborate effectively and efficiently. From tender award to first transaction through Single-window (with other Government Agencies on-boarded), the implementation takes less than 12 months. Product implementation uses a ready to be deployed product, proven reference model and consultative process which gives customers a head start in change management while minimizing time and effort. It also enhances effective gap identification, user acceptance and training. These activities can be carried out in the early stages of implementation leading to better adoption. Rich Internet Application Framework provides one of the finest user experience to ensure faster adoption and onboarding. Single product-base lowers maintenance cost while self-service capabilities lower operating costs. Open and agile architecture enables further deployment in functional areas and simplifies integration with external systems. Our customers are empowered to be agile in today’s fast-paced changing trade landscape. 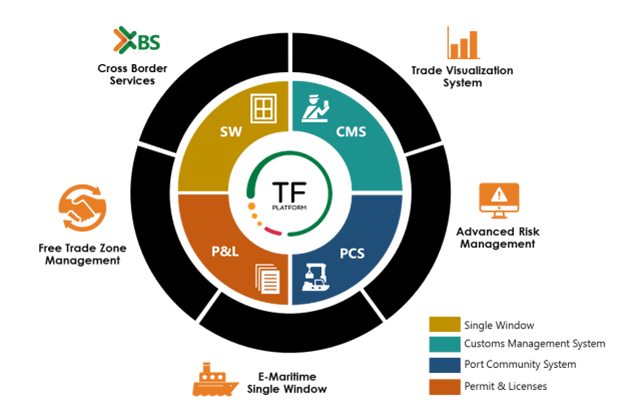 Powerful self-administrative capabilities, highly configurable functions, externalized business logic allow system administrators to adapt to business and policy changes quickly. Users can configure changes in business logic, update data elements, add new fields and make UI changes without depending on vendor. The product also has a provision for co-development which provides the flexibility to develop and enhanced deployed modules. TFP suite of products has a well-defined roadmap that is continuously upgraded to stay abreast of modern technology and align with the ever changing trade landscape. The intelligent integration of trade data and compliance reviews provide in-depth analytic capabilities that amplifies focus on value-add assurance activities and assists in strategic decision-making. With cross border solution, businesses benefit from enhancing administrative efficiency and effectiveness. The simplification and harmonization of physical movement of goods and associated information flow ensures faster turnaround time that promises greater cost savings and attracts investments.The improved interconnectivity across the trade community also facilitates optimum use of resources, expands operations and enhances the capabilities that the businesses already possess to increase profits. We are also taking strides to leverage blockchain for secure data exchange. Our OTB (Open Trade Blockchain) platform allows trade community to plug in and offer blockchain capabilities for government and industries to carry out new implementations leveraging blockchain technologies. Our customers can try out blockchain without having to invest upfront. Example of how TFP acts as a global platform for Governments and Businesses to collaborate for 360-degree trade activities. Please send us your enquiries!